With its new WS-DITU, Würth Elektronik eiSos now has an improved DIP switch in its product range: the gold-plated contacts make sure that the switch has a stable contact resistance. This robust switch is durable and its pins are securely protected against deformation. The product’s design ensures exact compliance to the grid dimension of 2,54 mm. 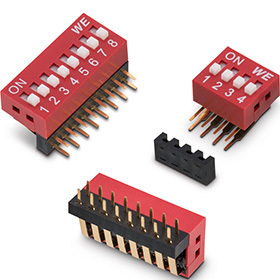 DIP switches are used everywhere that specific, basic settings need to be made swiftly and directly onboard the PCB. The WS-DITU DIP switch can be easily mounted manually and is available with 2 to 10 switch units (in even numbers of poles only). The insulation material has a UL94 V-0 flammability rating and is capable of operating at temperatures between -40°C and +85°C. The rated current is 25 mA, the dielectric strength 500 V, and the contact resistance 50 mΩ.